ALL-C™ is the first vitamin C capsule that does not contain non-vitamin C filler ingredients. Inteligent*Vitamin*C Inc is proud to introduce, by popular demand, the first vitamin C capsule containing nothing but Vitamin C, ALL-C. Normally a non-vitamin C filler is necessary for the capsule-filling machinery to function. 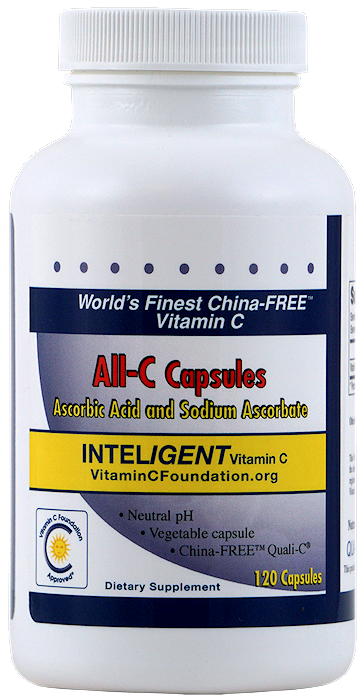 ALL-C is the first product known to the company to substitute that filler with a form of vitamin C.
The filler used in ALL-C, which is required for manufacturing, is ascorbyl-palmitate – a fat soluble form of vitamin C.
Each capsule has 500 milligrams of the world's best vitamin C, and each jar has 120 capsules. ALL-C capsules are Vitamin C Foundation Approved®. The capsule encasing the powdered vitamin C is made from a top-of-the-line organic cellulose. These capsules encase a mix of l-ascorbic acid and sodium ascorbate forms of vitamin C, made by DSM Nutritional Products (formerly Roche) in Darby, Scotland. DSM makes "Quali-C®," a non-GMO, non-Chinese vitamin C.
The vitamin C is imported from Scotland, and the capsules are manufactured and assembled by Solara Laboratories in Florida, a new company striving for excellence in supplements. "Inteligent*Vitamin*C is known for providing fine Quali-C® powders that support the high dosages recommended by the late Nobel Prize-winning chemist, Linus Pauling. Normally, added fillers in tablets and capsules make such high dosages problematic. The ALL-C capsules are Inteligent's first capsules that do not use any dose-limiting fillers, " said Robert Fonorow, Vice President of Vitamin C Foundation Approved®. Inteligent*Vitamin*C Inc is confident ALL-C is the best vitamin C capsule to fit consumer needs. This month only, as an introductory offer, buy one jar and get another one free. ALL-C™ is a trademark of Inteligent*Vitamin*C Inc.
Inteligent Vitamin C's ALL-C CapsInteligent's first capsules contain only vitamin C.